They look yummy, aren't they? 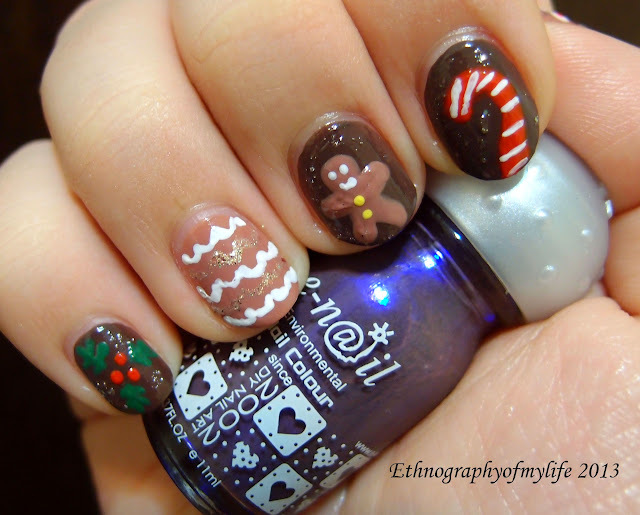 I create another Christmasy mani inspired by cookies yum yum yum! I use E-nail Mocha and Chocolate for the bases, My Wish, Banana Boat, The Wizard of Oz, Little Cherry and color bullet white for decoration. I also add a bit silver sparkles. I want to bite my fingers when I finished. lol Eh, the ring finger supposed to be an icing cookie, not sure if people can recognize it. My favorite is the small finger pattern and I may use this element in other winter manis soon. [Purchase] Got my Christmas Present!